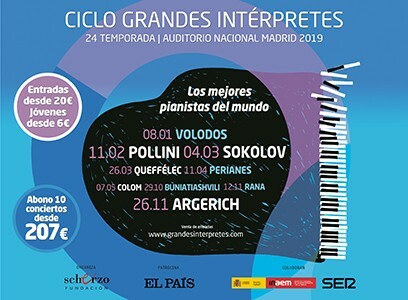 The Great Cycle Interpreters, organized by the Fundación Scherzo, He has gathered in its 24th season program to a handful of the best pianists in the international music scene. Between January and November 2019, They will go through the stage of the National Auditorium of Music, artists like Arcata Volodos, Maurizio Pollini, Grigori Sokolov, Javier Perianes, Josep Colom, Beatrice Rana y Khatia Buniatiaskhvili (both beginners cycle), Anne and Martha Argerich Queffélec with Kremerata Baltica. The young Sevillian pianist Juan Floristán premiere the new section of cycle, 'Debut between large', with a concert to be held 11 September 2019. In the ten Great Performers concerts you will hear works by Schubert, Rachmaninov, Scriabin, Beethoven, Failure, Chopin, Stravinsky, Scarlatti y Debussy, among others composers. "This year we propose new prices for a season out with great force (Volodos, Pollini y Sokolov) to end Kremerata Baltica and Martha Argerich. We guarantee a minimum of 20 Great Performers Series entries Youth, six euros, at every concert. further, our commitment to young Spanish musicians embodied in a concert of Juan Perez Floristán at a very special price ", highlights of the new season Patrick Alfaya, Director cycle. In this way, fertilizers ten recitals are placed from the 207 euros. Subscribers can renew your subscription until Friday 16 November 2018, date from which it will be possible to acquire new subscriptions. Loose tickets will sale from 20 euros. With nearly a quarter century of history, this cycle sponsored by El País, Inaem and Cadena Ser has been more than a hundred pianists who have participated in more than 200 concerts. This is one of the best in their specialty cycles throughout Europe and survives thanks to the public and their sponsors. Since 2002 runs concurrently cycle Young Performers scheduled recitals over fifty pianists, Today already established.